2. During the December 4, 2018 evening County Council Meeting, I believe I found an explanation as to why Council Members Browne and Sidhu were so invested in having the Port of Bellingham involved in proposing members for the committee and urging the Council to approve those members. If you listen to the video of the December 4 meeting, at about 1:13:30 Council Member Sidhu traces the history that led to the forming and funding of the Business and Commerce Advisory Committee. If you listen till about 1:15:30 or so you will get the main gist. The conversation between Council Members regarding related issues continues for a while after that. Infrastructure sounds good and planning is good, but this committee that has been put together is made up of a lot of old-school business players some of whom have not been the most supportive of thorough environmental review and regulations and that is scary when this “master plan of Cherry Point District” comes into play. According to Council Member Sidhu the Port seems to have taken the lead on doing this line of planning for a while. Meanwhile, so far there have been incidents that have demonstrated that our current Port Commissioners do not sometimes look hard enough into the materials and proposals put before them by Port staff and Port Executive Director Rob Fix in order to make fully informed decisions. To be fair, the same can be said about County Council Members and the proposals and materials that are run by them too. It’s on all of us to keep paying attention, so we can help these leaders stay informed, and hold them accountable. 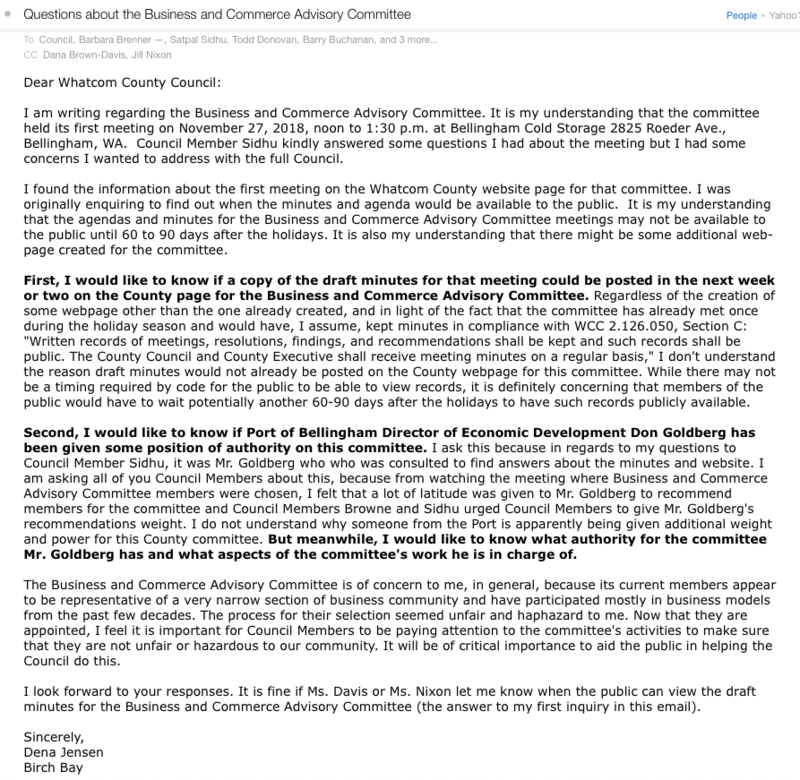 So, it will be good to keep an eye on all of this, and keep pushing for transparency and public engagement regarding the Business and Commerce Advisory Committee and the joint planning for economic development by Whatcom County, the Port of Bellingham and the City of Bellingham. This entry was posted in Blog Post, Commentary, Information and tagged Broadband, Business and Commerce Advisory Committee, Cherry Point, Cherry Point Aquatic Reserve, Cherry Point Industrial Area, Cherry Point Industrial Zone, Cherry Point Industries, Cherry Point Industry, Cherry Point Jobs, Cherry Point UGA, City of Bellingham, COB, Economic Development, Infrastructure, Michael Shepard, Port of Bellingham, Rud Browne, Satpal Sidhu, Whatcom County, Whatcom County Council. Bookmark the permalink.